Now we are coming for you! Watched the Agano burn and launched a full scale vengeance! Traversed through a massive onslaught. Survived a brutal assault against all odds. Nothing stands in your way! Pierced through the enemy lines with all your might. Raced against death an instilled fear on a never-ending parade of pirates. 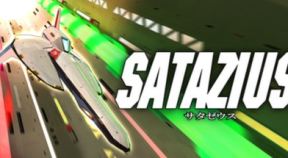 Blasted your way into the Heart of Satazius and successfully finished your suicidal mission. Got your first Game Over. Died at the hands of the Stage 1 boss's second form. Inadvertently collided against an asteroid on Stage 2. Got turned into a pile of molten metal by a certain massive stream of magma on Stage 3. Received the gentle treatment of a deadly massive laser on Stage 4. Smashed yourself against one of the closing gates on Stage 5. Got crushed by certain walls on the final stage, effectively ruining your entire run. Cleared Satazius on Normal difficulty or above. Cleared Satazius using 1 credit on Normal difficulty or above. Cleared a stage on Hard Difficulty and experienced the true SATAZIUS. Cleared a stage on Insane Difficulty. You can go deeper! Cleared Satazius using 1 credit on Easy Mode. Unlocked all the weapons on Normal difficulty or above. Used the first of many, many continues. Used 10 continues through different game sessions. Cleared the game with a score of over 800,000 points on Normal difficulty or above without continuing. Collected 10 stars in 1 stage. Destroyed 500 enemies using any main weapons. Destroyed 500 enemies using any sub weapons. Destroyed 500 enemies using any charge weapons. Reached MAX power on a main weapon. Reached MAX power on a sub-weapon. Reached MAX power on a charge weapon. Mistakenly picked up a speed down item. Got your first score extend!